A Pale Horse Named Death, the band featuring Brooklyn, New York native Sal Abruscato â€” who played drums on three Type O Negative albums ("Slow, Deep & Hard", "Origin Of The Feces", "Bloody Kisses"), as well as four Life Of Agony releases ("River Runs Red", "Ugly", "River Runs Again", "Broken Valley") â€” on guitar and vocals, will release its sophomore album, "Lay My Soul To Waste", on May 21 in North America, May 24 in Germany, Switzerland, Austria and May 27 in the rest of Europe via Steamhammer/Spv. The group has once again commissioned famed artist Sam Shearon (a.k.a. Mister-Sam; Rob Zombie, Fear Factory, Rammstein) to create the artwork for the Cd, which was mastered on January 17 by Ted Jensen at Sterling Sound in New York City. Regarding the musical direction of A Pale Horse Named Death's forthcoming album, Abruscato said: "The sound has evolved and become a bit more orchestrated. More harmony work has been done on this album, including new elements such as a Hammond B3 organ and piano. To me, the album has an even darker sound and feel than the first one." 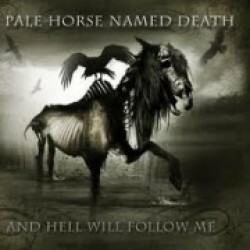 A Pale Horse Named Death's debut album, "And Hell Will Follow Me", came out in 2011. The band made its live debut on February 20, 2011 at the Starland Ballroom in Sayreville, New Jersey as the support act for Monster Magnet and Seventh Void. For more information, visit www.apalehorsenameddeath.com.